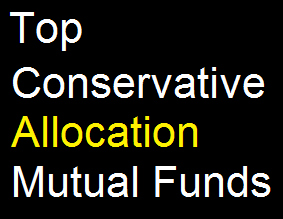 Find top conservative allocation mutual funds 2014. 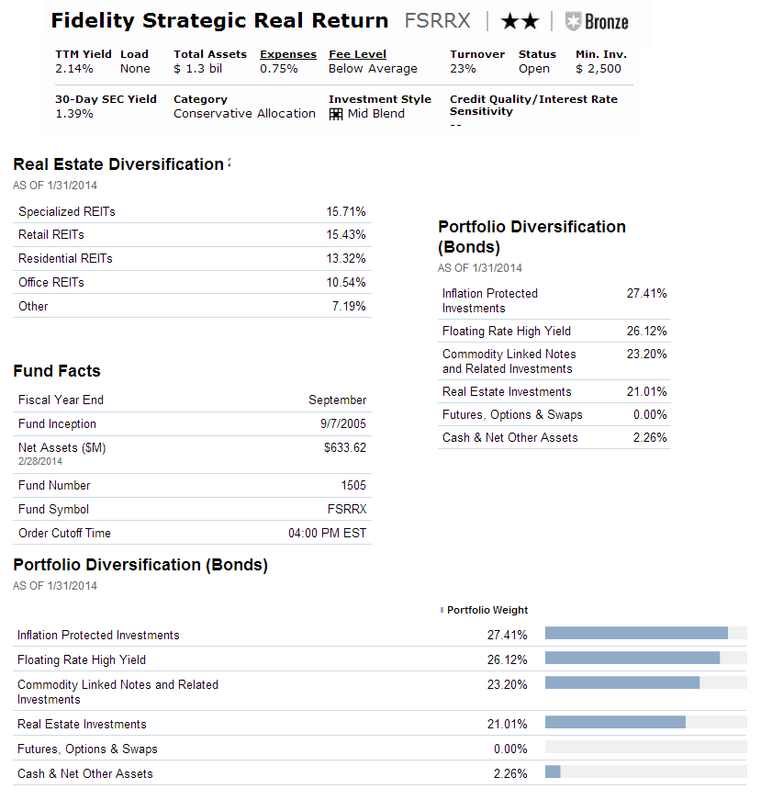 Best conservative allocation funds are Bruce fund, Natixis Diversified Income, etc. If you are a low risk investor, you may need to invest in conservative allocation mutual funds. As part of balanced mutual fund, these conservative allocation mutual funds invest in bonds, stocks and money markets. Typically it has about 60-70% of assets in bonds and 30%-40% of assets in stocks. Typically these funds have lower risk than moderate allocation funds or aggressive allocation funds. You can buy these top mutual funds for your brokerage account, retirement account (IRA), and 401k account. The minimum initial funding may be as little as $100 for retirement account. These top conservative allocation mutual funds 2014 are sorted based on its YTD performance in 2014. You can find the fund review below as well. The investment in the Bruce Fund seeks long-term capital appreciation. This top conservative allocation mutual fund has been in the market since 1983. It has 5-stars rating from Morningstar. The total net assets are $470 million. It has annual expense ratio of 0.75% and its dividend is 2.34%. The most recent distribution was in December 2013 ($11.33). This best fund recorded YTD return of 6.37%. It has 1-year annualized return of 17.61% and 10-year annualized return of 10.54%. This Spirit of America Income & Opportunities Fund has just been introduced to public in July 2013. Its objective is to seek current income and the potential for capital appreciation. William Mason is the current fund manager. The annual expense ratio is 1.50%. It has 0.25% 12b1 fee and 4.75% sales load. The YTD return is 5.00%. 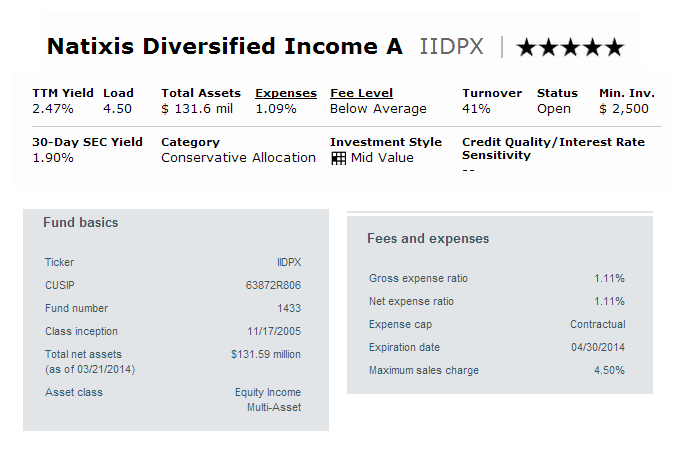 The CUSIP of this Natixis Diversified Income Fund (IIDPX) is 63872R806. Morningstar analysts rank this top conservative allocation mutual fund with 5-stars rating. Its dividend yield is 2.47%. It also has 1.09% annual expense ratio. This top conservative allocation mutual fund uses Mid Value investment style. It has annual holdings turnover of 41.0% as of March 20, 2014. The fund has recorded 6-years of positive return and 2-years of negative return. The best 1-year total return was recorded in 2009 with 33.32%. Morningstar analysts rank this Fidelity Strategic Real Return Fund (FSRRX) with 2-stars and Bronze rating. It has total net assets of $1.3 billion. The annual expense ratio is 0.75%. This best balanced fund has YTD return of 3.49%. The 3-year annualized return is 2.74%. As one of top conservative allocation mutual funds, it has no sales load. The minimum initial investment is $2,500. The top portfolio diversifications are Inflation Protected Investments (27.41%), Floating Rate High Yield (26.12%), Commodity Linked Notes and Related Investments (23.20%) and Real Estate Investments (21.01%).